Being an Official United States Air Force Photographer: Meet Sergeant Larry Reid Jr. Sergeant Larry Reid Jr. is one of a small club: he is not only aerial certified, but he’s also qualified in skill to reliably photograph from the air. But that’s not all, the number of photographers that like Ried gets even smaller, since he regularly photographs F16s from another F16- sustaining and performing under immense pressure on his body just trying to hold his arms up with a camera. How does he do it? Reid is the official photographer for the United States Air Force Air Demonstration Squadron, the Thunderbirds. I had no idea the Air Force specifically assigned photographers to events, and was even more clueless that they would consider sending one up in an F16 to capture the jets as they flew in formation, nearly regardless for sustained G’s. Reid is able to not only hold the weight of his own arms up while taking on 7 G’s (which compounds the actual weight of your arm multiple times), but also manages to both carry a camera (which has multiplied in weight as much as his arms have) and function with it. The amount of strength this takes is staggering. Reid has a great photo journalistic eye. He sees moments as they are happening and is able to perfectly capture them. On the ground, his images are full of emotion. When you see his photos, it’s as if you were there with him in that moment that will never repeat itself in real time, but because of him can be experienced over and over again by millions of others. Reid told me that his favorite part about his job was “capturing moments. Capturing moments that most people don’t get to see.” He loves photographing those upstaged, real moments of life. But it’s not just on the ground where Sergeant Reid dazzles with amazing imagery. In fact, it’s in the air that he really shines. Sergeant Reid is aerial qualified, meaning he can go up with the Thunderbirds and capture moments that only a small fraction of the population of even the military gets to see. “It’s just amazing what I get to capture, looking through my viewfinder,” Reid told me. When he is up with the team and assigned to capture a photo, often that photo they are trying to get is the team flying over a specific monument, such as the Statue of Liberty or, above, Pike’s Peak. “When we are on a dedicated photo mission, we may have one pass. One opportunity… over a monument that we might not have the opportunity to go back over.” But it is in those moments that Reid shines. 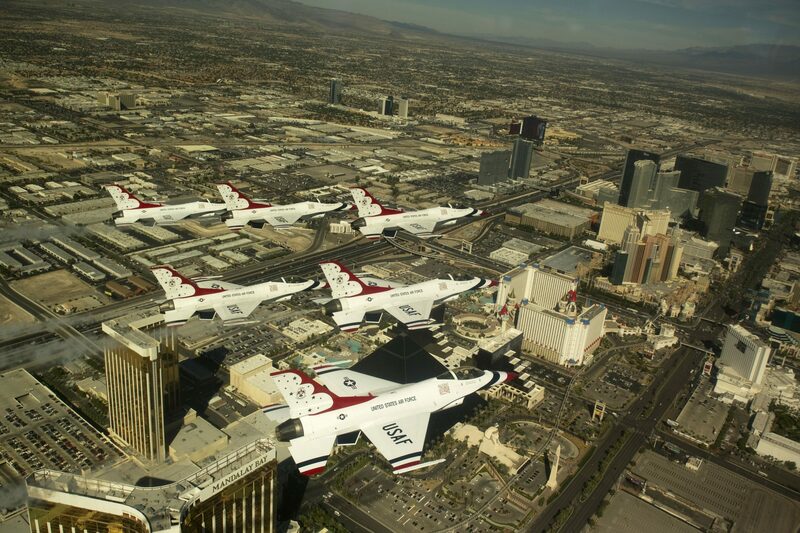 Reid’s assignment to the Thunderbirds is ending this week (this is normal, as most stints with the Thunderbirds only last a few years), and he will be reassigned to a different squadron, likely never to return to the Thunderbirds. I have no doubt that his skills will be utilized well no matter where he finds himself, but one thing is for sure: the Thunderbirds will certainly miss him. To see more of Jaron’s work, go .